This piece of artwork I found in an old scrapbook that mom has on the shelf in her bedroom closet. 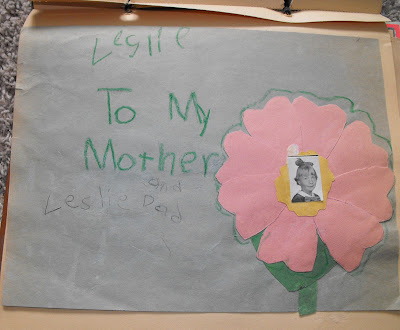 I was in the first grade when I (literally) cut and pasted this mother's day card. Ahhh... I can smell the paste now. I only know I was in the first grade because of the picture. Looks like I added dad's name later. I wonder why. I guess I didn't want to leave him out. Come to think of it, I don't ever remember doing art projects for Father's Day when I was in school.